Some creative innovations have attempted to lure audiences away from their televisions and into movie theaters over the decades. Many of these innovations related to image. Widescreen was a big one (pun intended) as it expanded the image well beyond the 4:3 Academy ratio of early televisions and older films, bringing the view into people’s peripheral vision. Some widescreen techniques required multiple projectors and special screens, while others just needed an adapter on the projector lens. Cinerama was one of these widescreen techniques. A documentary celebrating it, titled This Is Cinerama, opened with a rollercoaster ride in widescreen to showcase the new view. While visuals seemed an obvious way to innovate, others were following the scent of something new. Smell remains the strongest sense tied to memory, so why not bring related scents to movie plots? Though the basic idea had been around for more than half a century, Smell-O-Vision involved releasing scents automatically timed with the movie’s unspooling through the projector. The scents were pushed through pipes under the audience’s seats. Scent of Mystery (1960), written specifically for Smell-O-Vision, was the only film released using the process. About 30 smells wafted through the film’s screening, including flowers, coffee, perfume, and bread. Problems with delayed timing, uneven distribution, and mechanical and nasal noise ensued, resulting in critical reviews. The Variety reviewer claimed, “The Smell-O-Vision odors are more distinct and recognizable and do not appear to linger as long as those in Aromarama,” but overall the smells seemed unnecessary to solving the mystery. Time Magazine even went on to call Smell-O-Vision one of the worst inventions. A documentary film also attempted to use scent to capture the audience’s noses. Titled Behind the Great Wall (1959), this travelogue through China used the AromaRama process, another movie scent-delivery system that this time used the movie theater’s venting system. Scents included smoke, oranges, and incense — 72 in all throughout the film. Perhaps it isn’t surprising, then, that during this period of innovation also emerged one of the first virtual reality experiences — the Sensorama. 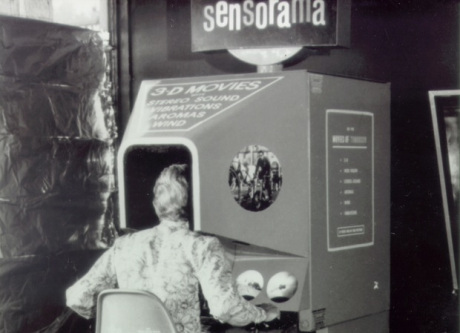 Developed by Morton Heilig, Sensorama delivered something called “experience theater.” The device brought together 3D film, stereo sound, smells (of course), and simulated wind to create an even more immersive movie-going experience by engaging four out of five senses. Taste still remains the elusive one, which is perhaps for the best. The Sensorama generally engaged one user at a time. The user sat on the seat, looked through the viewing holes, smelled scents through vents, and felt air movement through the vents and vibrations through the seat. A hood reduced external distractions. Sensorama films rendered everyday experiences into novel ones: a motorcycle ride, a dune buggy ride, and a belly dancer. One focused on a bicycle ride through Brooklyn. Another was titled I’m a Coca-Cola Bottle — I can only imagine what that one was about. Check out some of the dune buggy footage — complete with flickering film projection noise — in the first 30 seconds of this video. Two things strike me in these developments. The first is the mix of fiction and nonfiction. While Scent of Mystery was written specifically for Smell-O-Vision, the Aromarama scents included in Behind the Great Wall were added afterward. These experiments suggest the possibilities for multiple venues and purposes, including entertainment, education, advocacy, and others. The similarity with older and newer developments is the second one. Sensorama seems similar to the Kinetoscope, which engaged only one user — though only one sense — at a time. Going back to widescreen, This Is Cinerama used a rollercoaster to showcase its possibilities. With 360-degree video, a new contribution to the creation of virtual reality, one of the most-viewed experiences on YouTube consists of a brief rollercoaster ride.